Roxi Knopp sent this photo. 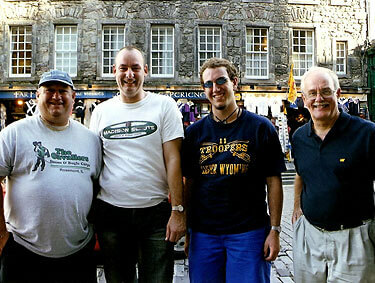 While taking a break from performances and activities of the Wyoming High School All State Marching Band in Scotland in August, 2006, we were approached by these gentlemen who had noticed the Troopers shirt being worn by member Casey Knopp. We talked to these gentlemen from Great Britain for more than 30 minutes about the return of the Troopers, their favorite corps (check out their shirts) and their love of drum corps in general. They have been to the World Championships a couple of times and are hoping to make the trip again in the near future. When it comes to drum corps fans it really is a small world. Casey marched as a member of the Troopers in 2005 in the cymbal line and is currently a member of the 2007 Troopers front ensemble.